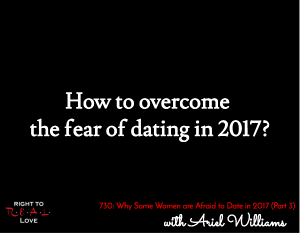 In this episode, Jay concludes his discussion with Ariel Williams by addressing the question: How to overcome the fear of dating in 2017? How to overcome the fear of dating in 2017? The importance of examining and identifying the root causes of our fears. Ways to overcome the fear of dating in 2017. The value in developing friendships before dating. God’s role in overcoming our fears. Why fear should never be a lifestyle. Don’t run from or ignore your fear. Write down the fears you have of dating in 2017. Examine the root causes of your fears. Meditate on 2 Timothy 1:7 (NKJV) or other bible verses.